Not to be confused with Video Compact Cassette, better known as Video 2000. The CVC format used a cassette slightly larger than an audio cassette (approximately 105x66x13mm) and was loaded with 6.5mm magnetic tape. 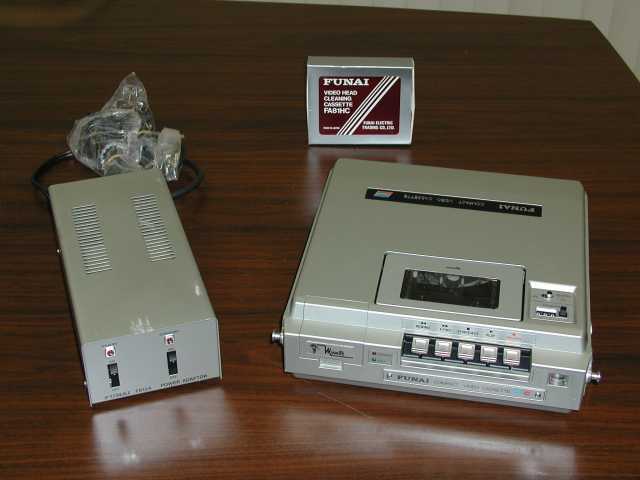 Unlike most other video cassette formats that have two spools of fixed diameter, being so small in size CVC's were designed to operate in a manner similar to a standard audio cassette: as the magnetic tape vacated one spool it would pass over the head of the player and be fed to the second spool of the cassette filling it out. Initially only V30 tapes were available which ran for 30 minutes, then later V45 (45 minute) and V60 (60 minute) models were introduced. 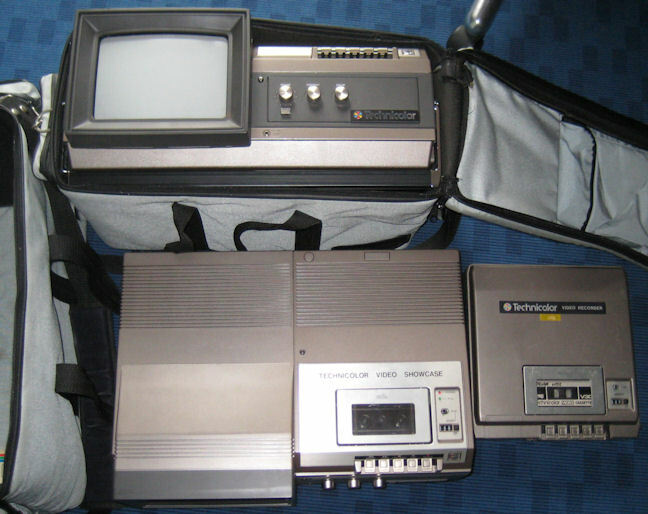 The format was released for NTSC, PAL and SECAM television systems (with cassettes labelled "VExx") and, like most analogue systems, tapes had to be played on machines using the same TV system as the recording. Funai 212 came with a JVC model GX-44E hand held Vidicon tube camera with a zoom lens. Model 212D was the NTSC version and 212E was PAL for Europe. The deck and electronics from the 212 were also used to build the model 335 Technicolor Video Showcase, which included a colour video monitor, speaker and contained an internal 12V battery. A lightweight television tuner pack was available to enable the 212 to record off-air television programming, but since it contained no timer it was not possible to set it for unattended recordings. Grundig also produced a CVC-format VCR for the PAL market, the VP100, based on the 212E but smaller. The VP100 weighed only 2.3 kg with battery, and had a separate power pack. Model 212 was also available in France as a SECAM recorder, the variant letter for this model is unknown. SECAM tapes play in monochrome on PAL players. Technicolor hoped that CVC would compete with 8mm film, but the Vidicon tube used for the bundled camera had poor low-light sensitivity, limiting its usefulness for home indoor use. An even worse attribute of the cassettes was the low quality of the tape stock which was prone to dropouts (appearing as lines of white snow) during video playback. These dropouts would show much more prominently than on wider tape formats. A drawback of the CVC player resulted in the mechanism's loading ring frequently failing to complete its intended travel as the decks aged. The load ring failure would render the unit unusable. Look up compact video cassette in Wiktionary, the free dictionary.